Mami Wata and the innumerable mami and papi wataspirits have many faces, and their identities rarely remain constant. As conditions change, so do the attributes, personalities, and actions of these fascinating and enigmatic water spirits. When taken together, the case studies presented in this section reveal striking differences, as well as remarkable similarities, in the beliefs and expressive arts for Mami Wata and her cohorts in Africa. As with the arts dedicated to her, the worship of Mami Wata as a specific spiritual entity is not a unified, homogenous phenomenon. Instead, it reveals an extremely diverse and fluid set of beliefs and practices that both reflect and guide social and religious worlds. There are many expressions of Christianity, Islam, Judaism, Hinduism, Buddhism, and other faiths, and this is perhaps even more true of the worship of Mami Wata and water spirits in Africa. Sacred waters bathe the histories of African peoples--waters of life, departure, and return. Sometimes they appear as tears of deep sorrow, sometimes as soothing and cooling streams sustaining existence and hope. Water connects world with otherworld, life with afterlife. Among Africans dispersed across vast oceans, these waters are emblematic of the ultimate journey back home to Africa and all those distant yet living ancestors. In Haiti, it is the journey home to Guinee across the rippling boundary of existence, imagined as a vast expanse of water that exists between life and afterlife. This is the abode of Lasirèn, La Baleine, Agwe, Simbi, Yemanja, Watra Mama, and all the water divinities of Africa and the African Atlantic. Their names are regularly invoked to strengthen the determination needed to endure the hardships and challenges of lives scattered and torn asunder by the avarice, arrogance, and brutality of those who would enslave others for their own benefit. The arts for African Atlantic gods and goddesses evoke complex emotions, hopes, and dreams as well as fears and nightmares. They may recall a sorrowful, troubled past, yet they offer hope and inspiration for a better future and the promise of an afterlife. In addition to their continually transforming histories of influence in Africa and its diasporas, Mami Wata and other African and African Atlantic water spirits have gained an even wider audience, as well as new meanings and import, by capturing the imaginations of a number of contemporary artists. This section of the exhibition features the work of several artists--men and women from Africa, Europe, North America, and the Caribbean--who have found in Mami Wata and her cohorts a highly intriguing subject matter. Even though they may not worship her, Mami Wata has entered the dreams and waking hours of these artists, seducing them into creating extraordinary works that open our eyes, minds, and imaginations to wonderful possibilities. The unique understandings and involvements of contemporary artists with water spirits also allow them to employ Mami Wata and other underwater denizens to address issues of gender, race, morality, identity, economics, environment, and politics. Throughout the centuries, African artists have created artworks in various media that underscore the dynamic quality of Africa's visual traditions. The categories presented here represent the breadth of the collection and are intended as a guide. The NMAfA collection includes tradition-based and contemporary works of art. Both address important issues of identity, history and aesthetics, demonstrate dynamism and reflect change as African artists respond to new ideas, materials and sources of inspiration. Tradition-based arts help shape and reflect established formal, functional and aesthetic canons. These artworks, which are used in everyday and ceremonial settings, address individual and community needs and serve social, religious and political ends. Humans and animals, the primary subjects in African art, depict desirable and undesirable aspects of human behavior. Deities, ancestors and other spiritual beings that are portrayed embody the breadth of African religious beliefs and practices. The creators of tradition-based African art are known and respected members of their communities. Unfortunately, those who created many of the exquisite works now found in museum collections remain unknown because their names were not recorded when the objects were collected many decades ago. In seeking to identify the makers of unsigned works of art, art historians have turned to historical records, oral histories and stylistic analysis to attribute works to a particular artist or workshop. Such research helps us better understand the relationships between artists and patrons and the circulation of objects in both the local and the global marketplace. Works of contemporary African art stress individual vision and innovation and often address local (usually urban) and global audiences. They find their place within both African and global networks of interpretation and exchange. Their subject matter is broad yet frequently focuses upon visions of personal, national or pan-Africanist post-colonial identity and addresses struggles seen and heard within the larger contemporary art arena. Africa's contemporary artists work in a wide range of media, selectively filtering the global exchange through local channels and bringing local aesthetics to bear upon broader artistic debates and practices. The cultures of Africa have created a world-renowned tradition of three-dimensional and relief sculpture. Everyday and ceremonial works of great delicacy and surface detail are fashioned by artists using carving, modeling, smithing and casting techniques. Masks, figures, musical instruments, containers, furniture, tools and equipment are all part of the sculptor’s repertoire. 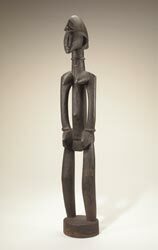 The human figure is perhaps the most prominent sculptural form in Africa, as it has been for millennia. Male and female images in wood, ivory, bone, stone, earth, fired clay, iron and copper alloy embody cultural values, depict the ideal and represent spirits, ancestors and deities. Used in a broad range of contexts--initiation, healing, divination, leadership, prestige and religious worship, to name but a few--African sculptures clearly demonstrate the central role of the arts in the African experience. Furniture in Africa ranges from everyday household objects, such as headrests and stools, to objects of high social status, such as the elaborately carved chair of an important village elder or the ornamental throne of a king. In many cases, artists from particular areas produce furnishings that have a uniformity of design suited to their function. While adhering to formal and stylistic conventions, artistic creativity and personal expression are highly prized. With a unique and inventive organic style, African furniture demonstrates individual artistry and the inventiveness of African cultures. African tools are often more than hand-held implements for toiling. Created with an obvious attention to detail, their elaborate forms and decorations add beauty and pleasure to daily tasks. Often fashioned in part as figurative sculpture, the spoons, axes, adzes, pipes, combs and heddle pulleys used in daily life are examples of the skill and creativity of African artists. Lavishly decorated tools usually serve a ceremonial, rather than functional, role. Two-dimensional painting in traditional African art includes images of animals and human figures found on the rock art of the Sahara and in southern Africa. Geometric paintings on house exteriors can be found from west to southern Africa. However, in a museum context, traditional paintings tend to be limited to works on panels or other portable surfaces from only a few places in of Africa. Ethiopian Orthodox style icons are found in this category. These distemper on wood panels are the work of artist priests and date from the 15th century to the present day. Devotional gifts to a church, they often show images of “Mary and her Beloved Son” flanked by saints. They are remarkable emblems of faith that also document Ethiopia’s interaction with Christian art in Europe and the Near East. Toys and games teach valuable lessons and help serve the social functions inherent in play. Gameboards hone manual dexterity and the skills of quick perception and strategy. Puppets reinforce community values while entertaining. Dolls, many made of ephemeral materials, let girls act out the role and skills of motherhood. African weaponry, which comprises diverse materials, techniques and forms, may be used for hunting, defense or as ceremonial objects that denote high social status. Basketry and hide shields, metal-tipped spears, decorative swords with leather sheaths and distinctively shaped throwing knives attest to the artistry of the African basket makers and metalsmiths who make weapons as well as other utilitarian objects to serve community needs. Often, the hilt or handle of the weapon is particularly well decorated and may be fashioned of carved wood, bone or ivory, covered in gold leaf or wrapped in brass or copper sheeting to further enhance its visual appeal and the status of the owner. Music is an important part of African culture. Instruments accompany the events of daily life and are prominent in public ceremonies and royal courts. The museum's collection focuses on those special musical instruments that, in attention to form and detail, are also works of art. The silent visual appeal of a massive slit gong, a delicately carved bell or whistle, or a beautifully crafted drum or harp augments the sound it creates when it is played. Throughout Africa's past, a wide variety of objects--salt, shells, beads, metal ingots, local and European coins, jewelry, woven cloth, weapons and tools--have served as money and measured wealth. Utilitarian objects made of iron, copper and brass alloys, gold and silver had intrinsic worth based on the durability and value of the metals, but such objects could also be melted down and refashioned to serve other purposes. Although some types of woven cloth, glass beads, cowrie shells and jewelry were used as money, it was usually as a secondary function. A necklace, for example, used for personal adornment may have been considered a form of stored wealth, available for exchange if needed. In many parts of Africa, even with the imposition of national coins and paper money, traditional currencies continue to have a ceremonial role. Textiles are among Africa's most vibrant arts. Whether made locally or imported, Africans use textiles of various colors, shapes and designs for daily or ceremonial clothing, as shrouds for the dead or as furnishing fabrics for the interior of their residences. Such garments indicate a person's status and fashion flair, but may also be worn as protection from negative forces. Both men and women weave in Africa. Though there are exceptions to the rule, narrow-strip textiles are traditionally woven by men. Broadloom textiles, by contrast, are usually woven by women. Materials include natural fibers such as raffia and bark, locally grown and spun cotton thread, locally produced and imported silk or cotton thread and a range of synthetic fibers. Dyes include natural vegetal pigments and aniline or chemical dyes. The appeal of African textiles has spread worldwide. Ghana's strip-woven kente and stamped adinkra cloth, Mali's mud-dyed bogolanfini, factory-printed textiles from West and East Africa and other African fabrics are now popular fashion accessories both within and outside Africa. In Africa, as throughout the world, what individuals wear may communicate their age, the identities of the groups to which they belong and their status within their communities. Costume accessories include jewelry, hats, shoes, amulets and fans. The artistry of these objects is manifest in the embellishments and materials used, such as raffia, cotton, silk, glass beads, copper alloy, gold, silver and ivory. Both men and women create beautiful containers, such as gourds, baskets, pots, wooden cups and bowls, to store and transport food and water and to hold their most valuable and useful items. Crafted in a variety of materials, many of these objects display decorative flourishes and attention to detail that mark them as prized personal possessions. Containers, such as ceramic pots or gourd bowls, may also be used in special ceremonies or become part of an assemblage of objects used in a shrine. Africa's long history of written languages and literacy dates to medieval times when great centers of learning were established. Beautifully illustrated, hand-written books and manuscripts demonstrate the interplay between the visual arts and language. Ethiopian Orthodox and Islamic religious texts and Ethiopian healing scrolls attest to the power of the written word to act as both narrative and design. The beauty and power of these scripts are often augmented by decorative patterns or symbolic designs created by talented illustrators and artists. Architectural elements are removable components of buildings-i.e., doors, door locks, windows and support posts--that are decorated. While serving obvious practical and aesthetic functions, most of these objects also offer spiritual protection to those who use the structure or testify to the wealth and social status of the owner. The majority of the museum's architectural objects are from West Africa. Woven elements of portable architecture, such as tent walls and blankets, are under Costumes and Textiles.